My favorite continues to be The Paper. In just under two hours, the 1994 film touches on multiple journalism idiosyncrasies and truths: the rush to get (and of getting) the story; professional jealousies; the dysfunctional daily news planning meeting, predictably held too close to deadline; most journalists cheating loved ones out of time and attention as they chase the love/hate of their chosen profession; the fight over seemingly minor things (a staffer’s chair, a stapler); reliance on Coke (although my preference was Diet Coke) to get through a hectic news day. Critics generally praised the movie but a few thought it too quickly tidied up all the principals’ conflicts within the 24 hours of a day in the life of the (then-fictional) tabloid New York Sun. 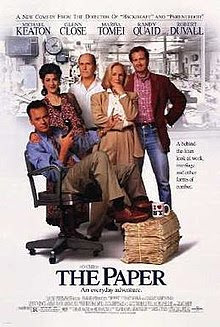 I feel I encountered many of The Paper’s characters, and their issues, during my career. Substitute “photographer” for “columnist” and I supervised a Michael McDougal for many years at The Associated Press. The other was Henry coming home after the challenging—yet ultimately honorable—day at the newspaper to find that his pregnant wife had been taken away for an emergency C-section. He rushed to the hospital to learn she had just given birth to a healthy baby boy. He fell asleep next to her. A morning news radio segment reported that due to the Sun’s exclusive story, two Brooklyn teens wrongly arrested for murder were released from jail. The 24-hour miracle of producing a daily newspaper gave way at least momentarily to the miracle of parenthood. Mark Mittelstadt was a longtime journalist with the Associated Press. This was first posted on Connecting, a daily newsletter for former and current AP journalists.